The video produced by the Foundation for Prader-Willi Research resonated with the public and USDA recognizes the video for "exceptional achievement." Two guests of the Foundation will be invited to the White House at a future date to the event celebrating the video challenge winners. Let’s Move! invites faith-based, community, and other organizations to create inspiring videos about their efforts to reverse the trend of childhood obesity. Increase participation in faith- and community-based efforts to prevent childhood obesity. Note: To participate, you must be a faith-based institution, community-based institution, or other non-profit organization, operating at the local or national level, and organized and domiciled in the United States. Each individual appearing in your video must provide a Video Image Release form and the person who created the video must complete a Video Copyright Resease form. For details on eligibility, please review the Official Rules. Create an account on Communities.Challenge.gov or log in with an existing ChallengePost account. On Communities.Challenge.gov, click “Accept this challenge” to register your interest in participating. This step ensures that you will receive important challenge updates. -Your video describes the program activities of a faith-based, community, or other non-profit organization to improve the wellness of children. The organization can operate at the national or local level. -Your video focuses on one or more of the following: efforts to promote healthy eating, physical activity, and/or access to healthy, affordable food. -Your video directs viewers to www.letsmove.gov for more information. -Your video is no shorter than one minute and no longer than three minutes. 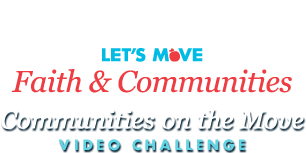 Video must convey a connection to Let’s Move! and cover one or more of the three Let’s Move! areas of interest: healthy eating, physical activity, and/or access to healthy affordable food. Video includes content that is compelling and instructive: (1) offers clear visual and audio quality, (2) encourages team-building and collaboration, and (3) does not compromise the health or safety of the video participants.